Bored men are dangerous. Not the good kind of dangerous, but the bad kind of dangerous. When they are not engaged at levels that tax their every fiber of will power, they loose the vision of who they really are and what they are called to be. 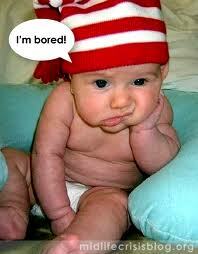 Bored men are dangerous to themselves and everyone else who depends upon their strength, integrity, honor and character. Bored men take what is not theirs to take. Bored men touch what is not theirs to touch. Bored men are dangerous. Oh yeah sister… that includes you too. When is the last time you listened to yourself pray? Sometime, you ought to hit the reverse switch on that little recorder in your mind and roll the tapes back to listen all over again as to how you pray. You might be surprised with what you learn. As confident as we outwardly appear in our relationship with our Heavenly Father, I wonder if we are truly that settled inwardly. How we pray could give us a few indications. For the greater part of my spiritual walk, I felt that the clearer I articulated my passionate petition, the better chance I had to get what I was asking for. God was really smart and insightful, so you had to bring your A-game if you were going to get anywhere with Him. HE was always way out front, so a guy had to work every angle to get things going in “my” direction. If it took a little arm twisting, God was up for the match. If it required tears, pacing, panting… I had some of that if needed. If He wanted loud… dude, I could shout with the best of them. Even my humble request to hear more from God, was attached to a downshifting “doing” gear that worked in perfect unison with my steering mechanism. (Hmmmmm… maybe I’m better at multitasking than I’ve given myself credit.) More times than not, I was going to do SOMETHING with what I heard. I’ve lived in various seasons of intense intercession, so I’ve said just about everything that there is to say in just about every way imaginable. I’m not convinced God has been all that impressed with the performance. Probably what was missing was the main thing all along; Me, desperately needing to readjust my perspective. I was always pretty sure of what I wanted, while only slightly aware of what I really needed. It could be that what we need to hear from God has more to do with us than the things we’re actually praying for. “Lord, will you move this mountain?” “Yes, but do you realize the mountain that needs to move is not the thing you’re focused on?” “Wait, are you talking about me?” Silence. The Spirit’s sense of timing is chilling perfection. Sitting with the Lord long enough to get His perspective is risky business. You just know He is going to futz with you. But, we probably need to get good with it. I do a lot of one on one discipleship and counseling. If I stop talking and the other person stops talking and I just continue to look at that person without saying anything, it usually only takes about 5 seconds before they’ll explode wanting to know what I’m thinking. People get really nervous if they think you’re reading their mail. Maybe they should, but if that is true with a man, how much more squirmy are we once the quiet lands in our time with the Lord? We’d rather show up with our hands full of our trinkets. Raw exposure leaves us so naked. Obviously our issue isn’t in the asking department. We can do some asking. Our disconnect might be more along the lines of the receiving part. To get ourselves into position to receive properly is going to require us to readjust our perspective. We don’t have to cut deals with Him. He’s a lover and a giver. We don’t have to treat God like he’s stingy. It might also need to dawn on us that God doesn’t require us to inform Him of what is going on down here. He already has our perspective. We need His. There is abounding goodness that we can’t see or receive while we stomp in front of Him with all our little bag of worries. A good readjustment now aligns our heart to the possibility that there might be another way to approach what has our focus and what He has already seen. Now we can know just how capable He really is. Seeing from His perspective invites rest and trust at a completely different level. It’s a good and very needed adjustment. One of the things I dig the most concerning the devotional material I’m in right now is the periodic introduction to canonized theologians with whom I’m not very familiar. Bonaventure was an Italian scholar who lived a short 53 years in the 1200’s. He was canonized by Pope Sixtus IV in 1482 and declared a Doctor of the Church by Pope Sixtus V in 1588. All of that happened long after he had passed to glory, so none of it ever got to his head. He entered the ministry through the Franciscan ranks and rarely ventured very far from the simple values of the Order. What caught my eye today was the opinion of the author that Bonaventure’s spirituality was mature (something I would hope we’re all trying to attain without becoming stuck in more religious ritual). Rohr calls him a “contemplative charismatic”. Bonaventure got the big picture by understanding that you can’t really separate your natural life from your spirituality. The two are radically fused together. He reasoned that the “traces” or “footprints” of God are everywhere. The discipline of our mind given to devotion towards God, leads us to see the unification of these things: (1) all of humanity is one big family; (2) hearing the hidden God is totally possible in a wide assortment of experiences; and (3) paying attention to His influence (that is evident everywhere) makes life exciting, an adventure, something worthy of being treasured every single day! BUT, where this leads us is even better. IF we are one big family, IF there is a voice to listen to (and there is), and IF His touch is on everything and everyone, it SHOULD result in a life of REAL GRATITUDE, PRACTICAL REVERENCE, and SIMPLE JOY. Do you have any of that working inside of you right now? So… work this deal backwards. Are you really grateful about your life or are you so hung in your past disappointments that you bemoan a dark cloud everywhere you go? 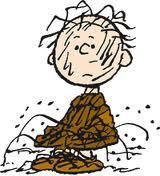 Like Pigpen, do you bring a little emotional clutter of what went wrong instead of what is going right? Can you bend the knee to what is mysteriously beyond you anyway; or do you have to have an answer to every question in your mind before you’ll settle in peace, knowing full well that there are no answers to some questions on this planet? Do you see how blessed you are or do you live in your own handcrafted prison of “woe is me”? How much more blessed do you have to be… in order to see how blessed you already are?